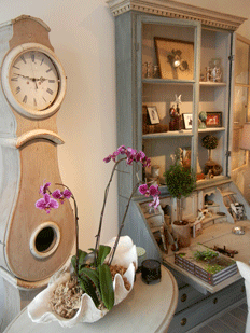 Petit and Olson is a refreshing new boutique filled with one of a kind antiques, curiosities and fabulous clothes. Owner Kathryn Petit has a keen sense of style, offering modern interpretation of classic sensibility. She draws inspiration from the past—from her own Scandinavian and French roots and the provenance of the pieces she finds. “I always wonder about the story behind an item—I think about the house an antique was in and how it got here,” says Petit. Red-and-cream hemp pillows by local textile designer Bainbridge Bluse and bedding by John Robshaw can be found here as well as rings from Seattle Designer Jamie Joseph, Rebecca Ray handbags and luxurious Magaschoni cashmere. It’s one of my favorite places to shop.